There has been a lot of recent attention about adopting a gluten free diet. 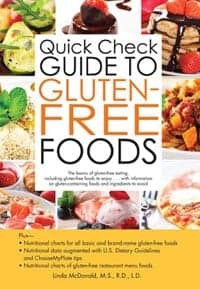 Whether it be for health reasons like Celiac disease, or a desire to just “clean up” your diet; The Quick Check Guide to Gluten-Free Foods by Linda McDonald, M.S.,R.D.,L.D. is a good book to start with. This is not a health book per se, but more of a reference book. It lists all the types of foods that are gluten-free in an easy to find contents list. Included in this list are the following; Grains and Grain-based foods, vegetables, fruits, dairy, protein foods, fats & oils, snacks & sweets, beverages, mixed dishes, baby foods, and last a list of almost 40 restaurants. It also lists types of products, like Earth Balance Organic Coconut Spread and Progresso Traditional New England Clam Chowder, just to name a few. It has a small introduction talking about gluten sensitivity, common misconceptions, and a list of foods and beverages to avoid. It also has a small section on healthy eating tips and healthy shopping tips. Now let’s say you wanted to look up a specific product, like V8, 100% Vegetable juice. You would find it in the Vegetable section of the book. It has a breakdown of how many ozs are in a serving. Then beside it in an easy to read graph it lists calories, total fat, saturated fat, cholesterol, carbs, fiber, sugar, protein and sodium. This list is constant throughout the book and alphabetized to make things that much easier when looking up products and food. The book is small and paperback, which makes it super easy to pop into your purse or bag, making sure that it is always just at your fingertips. At just $8.99US and $9.99CAD, it is well worth the small investment. I plan on using mine over the next while, to help pave my way to a cleaner diet. Thank you for your review! This book sounds like it contains a ton of helpful information. I have not been searching for gluten free foods, but for someone who is, this sounds like a must have!! Iwas so sssssssssssssssceptical about the whole gluten-free thing until I read a peer-reviewed study yesterday about how bad the wheat grown today is – very different and so much less nutritious than what our ancestors ate! I am going to give this a try and see how I feel! I have a friend who’s taken to a gluten free diet! This would be perfect for her! Will be getting this book for a friend, thanks! I have not committed to gluten free, but I am hearing more and more about it. This does sound like a handy book to have. A friend struggling with their weight for many years adopted a gluten free diet and has lost 100 pounds plus. I’m interested in learning more about the health benefits as well. They have all kinds of gluten free products on the shelves now which makes it so much easier for people on gluten free diets. Even restaurants have options too. This book is a great reference for people who are looking to be gluten free. I will definitely keep an eye out for this. I need to take a look at this gluten thing because my digestive track has been poor. I feel much healthier when I avoid gluten and all grains (not just the ones with gluten). Thanks for this review – it sounds like a guide I could use. i feel better when i stay away from gluten foods, however, most are so expensive. i feed my dogs a gluten free diet as well. i have a lot of digestive problems so it really helps me to stay away from certain foods.. Thank you for the great review . My mother thinks I have Celiac disease and needed information on gluten free foods. I just learned that my daughter-in-law to be may be intolerent to gluten. If so, this would be a great cookbook for her and also for myself when I will be cooking for her. This sounds like a great book to recommend to my mom’s friend. She has Celiac disease. Thanks for the review, this will be helpful. This looks really helpful! I have a family member recently diagnosed with celiac, so a book explaining gluten free foods would be so useful. I luckily don’t have Celiac’s disease, but it seems like it is a healthy choice to avoid most gluten-enriched products. This book would be a great reference guide! What a great reference! My mother is allergic to gluten, so I will be sharing this with her. i think im going to order this for my cousin. her daughter can not have gluten and she is still trying to adjust. This looks awesome! I have celiac disease along with my niece so this book would be a welcome addition to planning family trips. I am pretty good anymore at knowing what I can and cant eat, but sometimes slip up. Actually, last night I ate a bite size milky way thinking it was safe. Turns out it has gluten in it. This sounds like a great book for my daughter. Thanks for sharing it! She’s gluten sensitive and I’m going to try to get this for her. My neighbor has Celiac disease and has been eating gluten free for many years now and I have sampled some of her recipes and most of them have been great. This reference book would be so good for her to have that I’m going to suggest it to her or maybe even buy it for her. I have been contemplating going Gluten free myself if only to clean up my diet. My sister has gluten intolerance and this book would be great for her or anyone for that matter. Have not made the jump to Gluten Free yet but I have been thinking about it. Good to know there are cookbooks available to help with the transition.